I first though this was a juke joint, considering its small size and location just outside the city limits of Morgan. Shawn Weathersby wrote that it might be associated with the Milner Grist Mill but Toni Milner writes: It is an old beer joint. My grandfather Sonny “Plunk” Milner sold beer out of it back in the day. The Grist Mill is housed in the building to the left of this building. Thank you so much, Shawn. I’ll add that to the post. It is an old beer joint… My grandfather Sonny “Plunk” Milner sold beer out of it back in the day.. The Grist Mill is housed in the building to the left of this building. 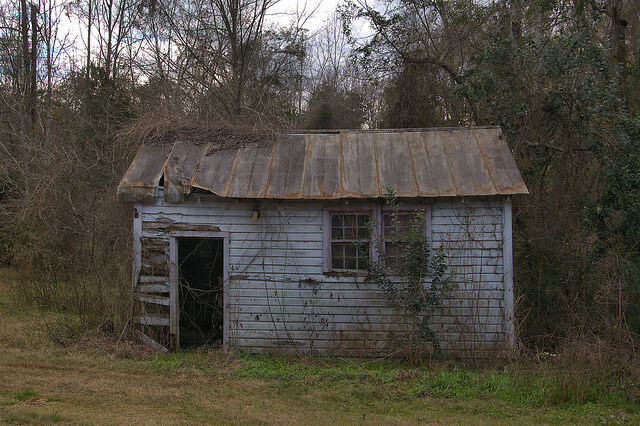 This old small broken down house I think is an old slave house. vanne hanisch-godoy based on what?